Jack Owens scored his first try of the season to help St Helens inflict a first defeat on Catalans Dragons in Perpignan this season. Adam Swift, Mark Percival, Ryan Morgan and Adam Walker tries put Saints 22-18 up at the break, with Thomas Bosc, Julian Bousquet and Iain Thornley responding in a fierce, open contest. Ex-Saint Luke Walsh converted Paul Aiton's try to edge Dragons ahead. Owens, however, collected a fine Theo Fages pass to help ensure victory. Victory was Saints' second of the season from five games, while Catalans are winless at their Stade Gilbert Brutus home since the opening day of the 2017 campaign. Swift ran in the first of five tries in the opening 20 minutes, with Morgan's effort edging the visitors ahead after Bousquet gave Catalans the lead for the first time. 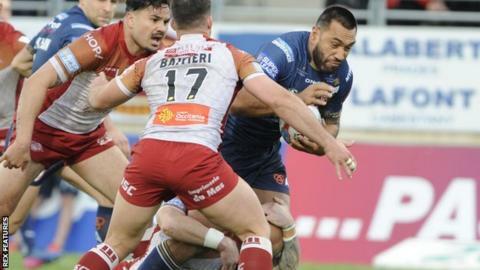 While their advantage lasted just five minutes in the first half, Aiton's touchdown to help restore the hosts' lead in the 47th minute marked a sustained period of dominance after the interval. Despite their superiority, Catalans failed to add any more points and the resilient Saints prevailed, thanks to a fine piece of skill from Fages to find Owens with a flicked pass while off balance. Percival's touchline conversion to open a one-score lead put pressure on the Dragons to chase the game late on to avoid a second straight defeat, but they failed to carve out another meaningful attack at the end of a draining, high-quality match. Catalans Dragons: Bosc, Thornley, Inu, Wiliame, Yaha, Walsh, Myler, Baitieri, Horo, Garcia, Moa, Aiton, Casty. Replacements: Bousquet, Simon, Burgess, Da Costa. St Helens: Makinson, Owens, Morgan, Percival, Swift, Fages, Wilkin, Walmsley, Roby, Douglas, Taia, Peyroux, Knowles. Replacements: Amor, McCarthy-Scarsbrook, Walker, Lee.